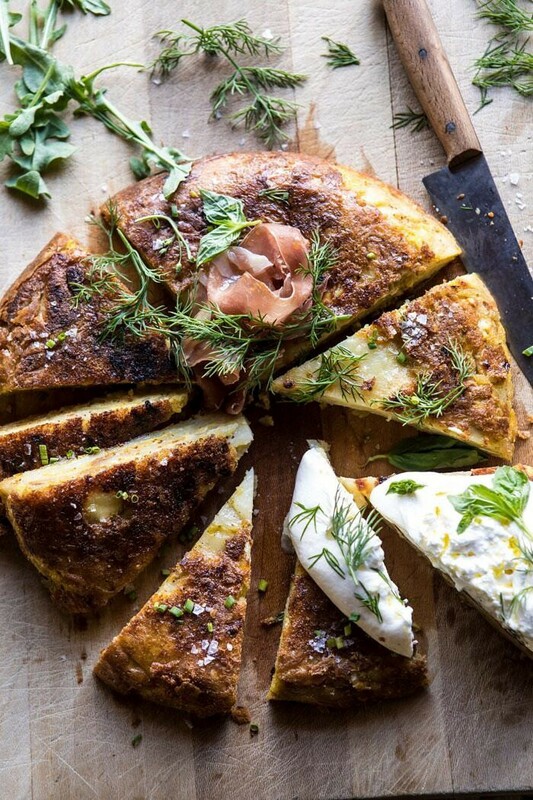 Spanish Tortilla with Burrata and Herbs. 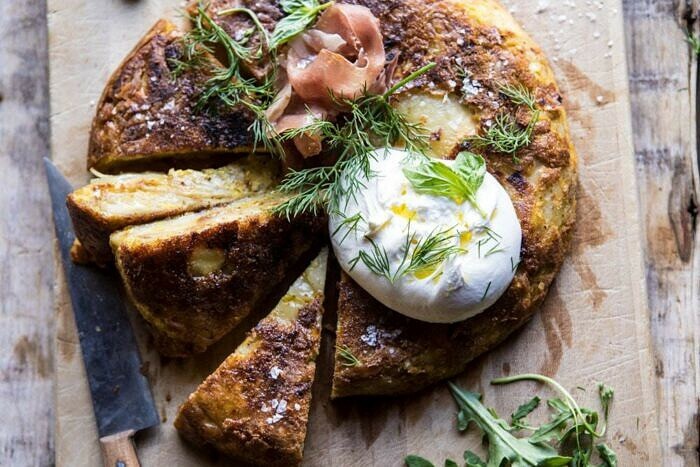 Sharing my take on a Spanish tortilla with potatoes, eggs, fresh garden herbs, prosciutto, and burrata cheese. 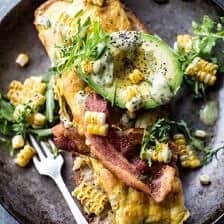 This easy Spanish inspired opened faced omelet topped with fresh greens is a great Sunday brunch item or simple weeknight dinner. Either way you serve it, everyone is going to love these Spanish Tortillas. Bonus? You can even make them ahead of time for easy entertaining. For those of you who follow along with HBH on Instagram, you may recall the story I put up a couple of weeks ago showcasing all of our chicken eggs. I am not joking when I say that I am up to my ears in fresh chicken eggs. I literally have one whole fridge full of eggs. No messing around, an entire fridge. I’m definitely not complaining, it’s amazing to not have to cook and bake with store bought eggs. Nothing beats fresh eggs and I feel pretty grateful that we are able to care for our own chickens (we have a total of 13 right now). All of these eggs mean that I’ve really been putting a focus on using eggs in recipes. Last Tuesday I shared my go-to breakfast grilled cheese with scrambled eggs and pesto and on Friday I shared my favorite creamy mocha custard. Both recipes have the same star ingredient, eggs! And today’s recipe? Yup, you guessed it, the star ingredient is again, eggs, and lots of them. Eight to be exact! 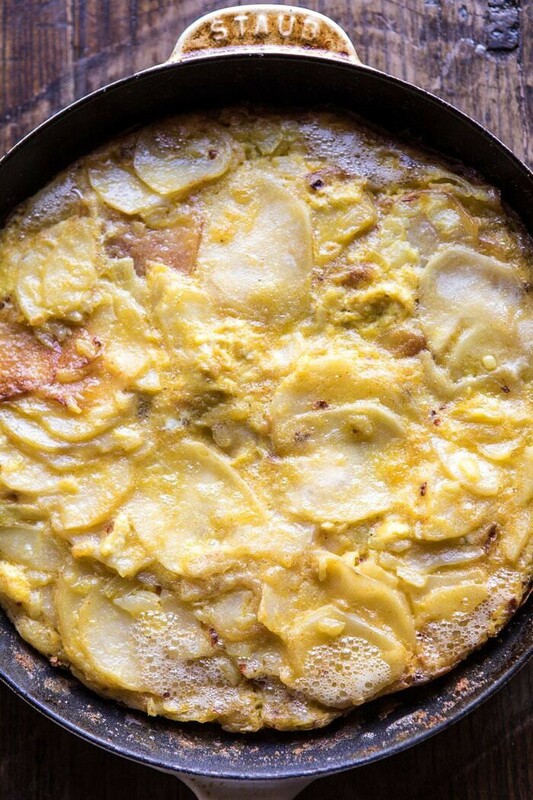 If you’re unfamiliar with a Spanish tortilla, it’s simply just an opened faced omelette filled with olive oil infused potatoes. Traditionally it is very simple, but I added a few fresh ingredients, like prosciutto, garden herbs, and burrata cheese (some of my all time favorites) to really make this colorful, extra flavorful, and of course delicious. 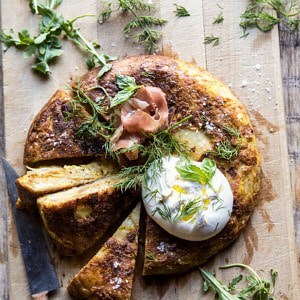 When I set out to make this Spanish tortilla, I had a million ideas on different ways to flavor this up and make it exciting, but in the end, I stuck with the fresh flavors of herbs to brighten the dish. I’ve found that sometimes it’s really great to have recipes that are packed full of many flavors, and other times, it’s great to have recipes that are simpler and focus more on one ingredient versus lots of different ingredients. 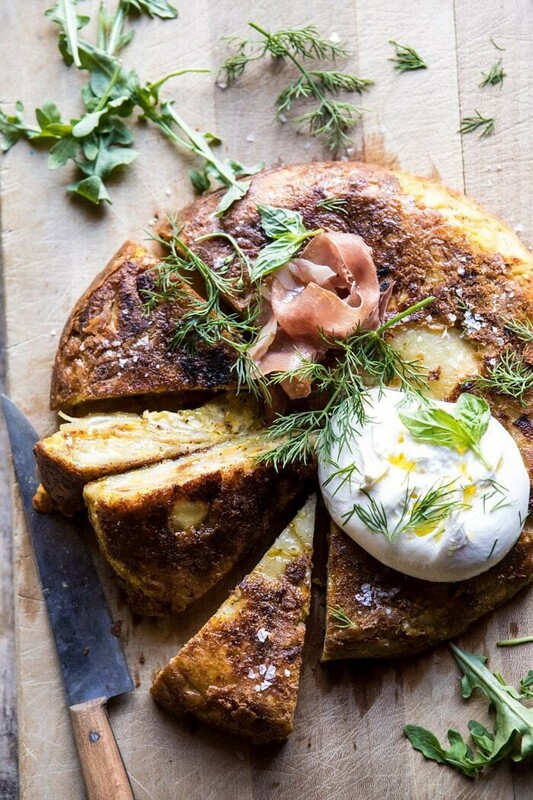 This Spanish tortilla is really all about the potatoes and eggs, so I let them shine by highlighting them with a few herbs…and a little burrata, because I really just couldn’t resist. It sounded way too good. This recipe requires a lot of extra virgin olive oil. You’re going to think that an entire cup of olive oil is a lot, and while it is a lot, it’s not all being cooked into the recipe. Let me explain. Because we are mixing the potatoes with eggs, it’s important to precook the potatoes to ensure that they are not hard in the final product. Potatoes take much longer to cook than eggs, so pre cooking them in olive oil is a must. But why so much oil? Well, for one, we are using a lot of potatoes, so a good amount of oil is needed to submerge the potatoes. And two, the extra virgin olive oil infuses the potatoes with amazing flavor while cooking them at the same time. You’ll drain off almost all of the oil once the potatoes are precooked and in the end you’ll only end up actually using about three to four tablespoons of oil. SO. To sum that all up, don’t stress about the amount of oil being used. It’s all needed, but yet, you will not be consuming all of it. Go with me on this. Once the potatoes are precooked, everything else happens pretty quickly. You’ll toss the potatoes with lots of eggs, herbs, and black pepper, then cook this mix up as you would a frittata. It’s finished off in the oven with a quick browning under the broiler and then topped with fresh arugula, prosciutto, and burrata cheese. 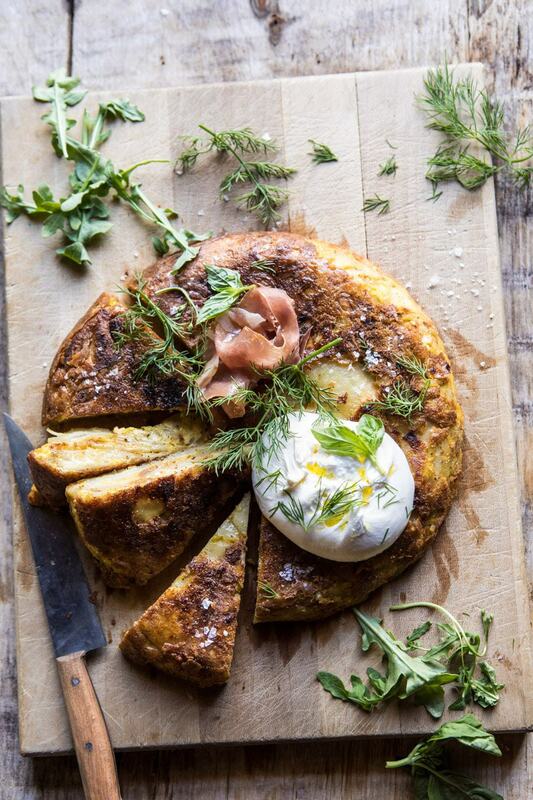 Breakfast, brunch, lunch or dinner, this Spanish Tortilla is simply perfect. The potatoes are crisp, the eggs are cooked just right, and the toppings are the perfect finishing touch to it all. And you guys? if you think you might not need that ball of burrata cheese, think again. It’s creamy insides are too good for words when paired with the crisp potatoes, herbs, and eggs. Don’t doubt me on this, just do it. Cool. Now that the important stuff has all been taken care, let me urge you to make this for dinner tonight. It’s a little longer on the cooking time than a lot of recipes I’ve been sharing recently, but it’s worth every last-minute spent in the kitchen. 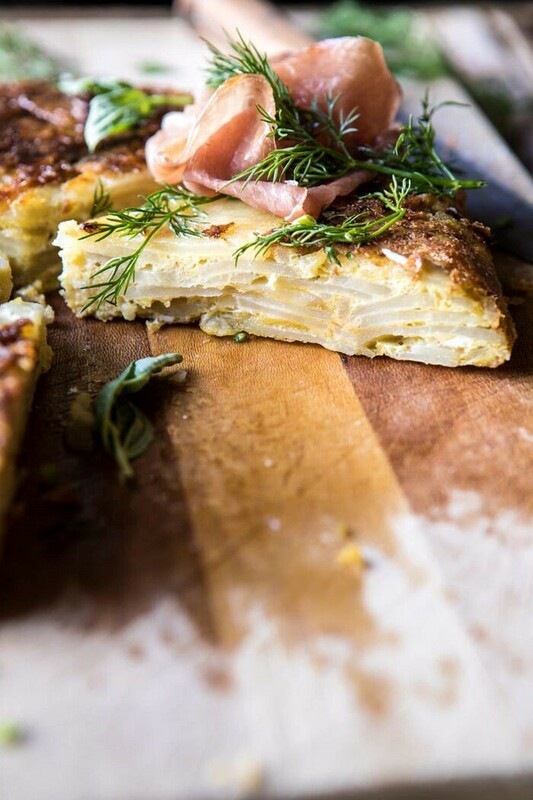 If you make this Spanish Tortilla, please be sure to leave a comment and/or give this recipe a rating! I love hearing from you guys and always do my best to respond to each and every one of you. Oh, and of course, if you do make this, don’t forget to also tag me on Instagram so I can see! Looking through the photos of recipes you all have made is my favorite! This tortiila is too good not to share! 2. In a large, oven safe skillet, heat the olive oil over medium heat. Add the potatoes, onion, and salt. Bring the oil to a gentle bubble, then reduce the heat to medium-low and cook, stirring often, until the potatoes are fork tender, about 20-25 minutes. 3. Using a slotted spoon, transfer the potatoes and onion to a bowl. Add the the eggs, basil, dill, chives, and a large pinch of pepper, gently stir to combine, being carful not to break the potatoes. 4. Strain the oil out the skillet and wipe the skillet clean. Heat 2 tablespoon of the reserve oil over medium high heat. Add the potato and egg mix and cook, stirring gently until the eggs just begin to set, about 2-3 minutes. Spread the mix into an even layer and reduce the heat to medium-low. Cook, shaken the pan occasionally to prevent sticking until the eggs are set and just cooked through, about 15-20 minutes. Transfer to the oven and broil 2-3 minutes. 5. Remove from the oven, run a spatula around the edge of the skillet to help release the tortilla, then carefully invert onto a serving plate. Let sit 10 minutes. Top with prosciutto, burrata, arugula, and fresh herbs. Slice and serve warm or at room temperature. Enjoy! Lemon and Oregano Grilled Chicken. 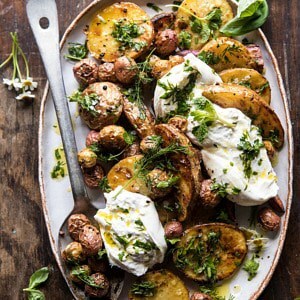 Roasted Mixed Potatoes with Spring Herbs and Burrata. As a Spaniard, I love the potato tortilla (that’s how we call it here). However, the way we like it most is when the egg is still slightly raw, and with cubed potatoes instead of sliced. Can you share the potato quantity in approximate cup or weight amounts? Potatoes vary in size so significantly! Thanks! I’m confused. There are some typos in this recipe (like, “… transfer the potatoes and onions to a boil” instead of a bowl. But what confuses me is the first instruction. To bring olive oil to a boil requires getting it to 570 degrees F. I’m not sure that’s safe or even possible. Can you clarify or explain the cooking of the potatoes? I really want to make this, but I don’t want to set my kitchen on fire. Hi Dean! The recipe is fixed! I hope you love this dish! This is one of those recipes that proves you should never say, “I can’t make this recipe; I don’t have such and such ingredients.” I don’t have potatoes, but I have a bag of frozen hash browns and a crisper drawer full of zucchini that would work perfectly in this. I used my last onion last night, but I have a bunch of scallions that need to be used. Yes!! I hope you love this recipe Monique! Thank you! Is this supposed to go in the oven at some point under the broiler? Hi! Yes I for about 2-3 minutes on step 4! I hope you love this Jen! I’ve actually never heard of a Spanish tortilla before…but I am intrigued!! Looks so delicious! And such few, simple ingredients too! 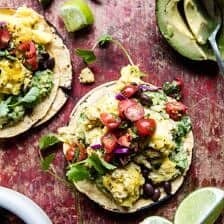 My go-to tortilla recipe has cubed potatos, cubed oninons, lots of eggs and a good pan to make it! I never meausre anything, just go with it as I start cooking and depending on how many eggs I will use. You need to see that the eggs cover the mixture of fried potato and onions. The first step though it to cube potatos and onions and fry them together (literally fry them, like floating in oil) with good quality olive oile. Once potatos and onions are cooked (I like to fry them together so potatos get also the onion flavour while cooking), a little bit crips in the outisde but soft in the inside (this is how we like it at home) you have to remove them from the oil, place them in a tray with lots of paper towel so you extract as much olive oil as possible. Do not throw away the used olive oil at all! you let it cool and save it make another torilla. I usually use the same olive 3 times, and it’s perfect. I keep it in a mason jar. Anyway, going back to the method. Once the olive has drained in the paper towel and your fried potatos and onions are cooked you wisk the eggs in a bowl (you need to wisk them a lot, till they are very fluffy)), and add the potato mixture in them. If you see that there’s more potato compared to eggs, wisk another egg separately and add it to the mix (you can repeteat this if necessay untill you see a smooth egg mixture). Add some salt and pepper to taste and tortilla is ready to be cooked in the pan which should be very well oiled (unless you are using a non-stick pan). Once it’s warm throw the egg and potatos mixture in it, REduce the heat to low, cover it with a lid and let it sit for a while. it has to be cooked really slow, When you see that borders are all the way cooked, you need to flip it over, which is the hardest part of all… Use a big plate or a big lid. (search for some videos on youtube, they might be very helpful to see the procedure hehe). then throw it back to the pan on the uncooked side and let it cook really slow again. Leave it for a while, no particular time. You can test if it’s done by putting a stick in the middle and see if raw egg is still visible. The tortilla can be served undercooked, regular or overcooked, so pick your choice here! So, this is basically the go-to procedure in most houses around here, of course it can be addapted and add anything you like! I sometime add vegetables, fresh asparagur, artichokes, peas, spinacs, canned tuna for summer which makes perfect sadnwhiches with the leftovers… use your imagination. Just think that everyting you put in the tortilla has to be previously cooked somehow. you want to know a quick tip for a real fast potato tortilla?? use potato chips to make it! I swear it’s good and really cool as an appeatizer. It’s made in just minutes and ends up being great!! Have a wonderful day everyone!! Please try to make tortilla, with oven, pan, any way you prefer!! It’s really delicous, and perfect for summer meals. By the way, I love the burrata idea to pair with tortilla! Hi Susanna! Thank you so much for this! I would love to try this way soon! I usually check your blog for recipies and am usually very satisfied with them. However, this time I think a little feedback can be positive. I am not sure if the modification of the original spanish recipe (I don’t mean the herbs addition) is a choice of yours or if you haven’t been showed how to make it. By the way, only trying to help if your case is the latter. I have been making tortilla since I was a child, and would never use the word ‘easy’ for its process. However this wasn’t the point of my comment. I have never heard of a Spanish tortilla that has visited the oven, as it kills the most important aspect of spanish tortilla: the texture. Spanish tortilla has to be soft on the inside, the eggs being slightly runny and juicy. This is achieved by letting the warm potatoes and onion Rest In Peace with the eggs for a while, and turning the tortilla in the pan (using a plate) after 2-3 minutes of soft heat. After this, another 2 minutes is enough for the tortilla to be ready to eat. Please don’t ever put it in the oven, or in case you do it maybe don’t call it Spanish. Thank you for your blog, it is an inspiration for my daily cooking. Thanks rocio mazon, glad to see that someone else believes that a Spanish omelette (tortilla) should never be put in the oven. Firstly the amount of oil. We use more. The mix should be fried in plenty of oil otherwise you are constantly turning it over to ensure it is all cooked evenly. Olive oil is a good strong oil and can be reused, only once or twice but can be reused. Don’t throw it away and use it next time you fry something in oil. Secondly the potatoes. I have made Spanish tortillas in a number of countries, I have even taken good Spanish olive oil with me. It has not always turned out a well as I would have liked. I have come to the conclusion that the choice of potatoes are also critically important. Spanish potatoes tend to be dryer, perhaps because of the climate. Look for potatoes that don’t feel wet when you peel them. I like to just crisp the potatoes when frying, I think it adds to the flavour. Again a questions of taste. Eggs, I like them slightly undercooked, otherwise the tortilla in my opinion can be a little dry. Again, a question of taste. One last comment, an old gentleman that lived near here always said that the best tortilla he had ever eaten was when at boarding school some 80 years ago in the north of Spain. I had to visit the place of course and found out that it was fried in lard! It is actually a fantastic tortilla and far from fatty as the lard is drained off just as the oil is in this recipe. If you want something different give it a try! Thank you so much for your comment! I would love to try this way soon! 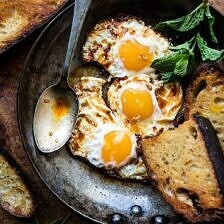 I’m going to be making this for our cookbook bookclub this Sunday. You say 3-4 yukon gold potatoes but do you know approximately how many cups. I got small golds and I’m sure it’ll take more than 4. Your blog is amazing! I’ve made several of your recipes and they have all been great. Did you use a 10 inch skillet? I felt like my potatos were crowded and took more than 25 mins to get tender.